Have any burning questions? Send ‘em along to diane@bydianedaniel.com and I’ll post them on the blog and here, along with the answer of course. Q: Have you listed every farm, winery, farm-to-table restaurant, farm stay, farm market, etc., in the state? Heck no. Not even close. I actually wanted to avoid that. Instead, I have chosen the ones I consider to be outstanding in their fields, so to speak. This doesn’t mean the most high-end (though a few fit that bill), it mean places where I think you will have a great time. Also, especially with family farms, it was very important that they be open to the public, whether regularly or by appointment. Q: But how would you know if they are really open to the public? Every farm would welcome you, of course, so they could be in the book. Whenever possible, which was most of the time, I went undercover. I wanted to have the same experience any traveler would. When I contacted farms by email or phone, I identified myself as Diane Daniel, traveler, not Diane Daniel writer. Many didn’t even get back to me, so I just skipped those. Q: Did you really personally go to the more than 400 places listed in your book? If my 1994 Honda Civic could talk, it would tell you that we traveled more than 23,000 miles just in the state of North Carolina doing research. The handful of places I didn’t reach were vetted by independent sources, i.e. my spies. Some restaurants I didn’t make it to because I could rely on reviews and articles. But if I didn’t know of them firsthand, I still followed up on the phone with the chef or owner. And if they said sourced their food locally, I asked them for the names of farmers they worked with. Q: Aren’t you worried that places you list in the book will close or change radically? That haunts me! It happened on several occasions during the researching, writing, and editing processes, and it will keep happening. I’ll post all updates under Updates to the Printed Book. If you encounter anything in the book that is incorrect, please let me know and I’ll check it out and spread the word. Q: I see on your website that the book was “supported by a grant from the Golden Leaf Foundation.” What does that mean? In 2010, Golden Leaf awarded UNC Press $23,060 to help with the production and publicity for Farm Fresh North Carolina. None of that money goes to me, and Golden Leaf had zero input in the editorial process of my book. This money was tied to Golden Leaf’s Local Foods Initiative, which funds projects “designed to help farmers access new and expanding markets, including the market for local foods.” UNC Press and I believe that the book will encourage visits to the places mentioned, thereby leading to sales of local foods and products. In fact, the Press estimates that the economic impact of the guide could exceed $750,000. Wow, that would be cool and immensely gratifying! Q: Whose idea was this book, anyway? In that there’s no such thing as an original idea, Farm Fresh North Carolina was inspired by the second in a nascent series by Menasha Ridge Press called “The Best of Virginia Farms Cookbook & Tour Book,” by Cici Williamson. I love travel, farms, food, and my home state, so why not pitch a North Carolina version? I talked with Menasha Ridge about it, but I had a fairly different book in mind, more a travel guide than a cookbook, and with a focus on sustainable farms. Understandably, they wanted to stick with their own model, so I struck out on my own. UNC Press was my first choice for a publisher because they know North Carolina, obviously, and I’d heard they had crack editorial and marketing departments. I was thrilled that they were as excited about the book as I was. They have been beyond wonderful to work with, and I’m not just saying that because they built this website. 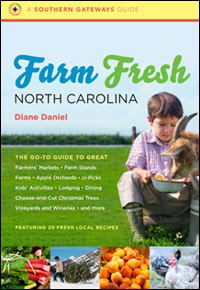 Farm Fresh NC.com is great, many thanks – can’t wait until the book is out! Hi there and thank you for pulling together and publishing this book. I just ordered my copy and can’t wait to receive it. In the coming weeks I will be opening Simply Local, a small grocery store that will source local foods, it will complement and operate in conjunction with Atherton Market (a farmer’s market) here in Charlotte. I would love to offer copies of the book at the store. Can you provide me the contact information so that Simply Local can purchase copies of Farm Fresh North Carolina for resale? Thank you. Absolutely! I just need to know how to reach you. I’m doing an event at Atherton in May and will ask for your contact info. Thanks for the inquiry and the praise! All the Counseling staff is coming tonight to meet you. We are from the North Carolina School of Sci. and Math. in Durham. On 5/18, 3:30 to 5, we are hosting an event called CELEBRATE NC! and we would love for you to come with your books to sell. Our students come to our residential, public school from all over NC, so we love it when someone highlights our state. See you tonight at the brewery! Your method of describing the whole thing in this article is truly nice, all can simply be aware of it, Thanks a lot.